With more and more people aging in place, a home they moved into 20 years ago may no longer be able to serve the homeowner’s lifestyle today. 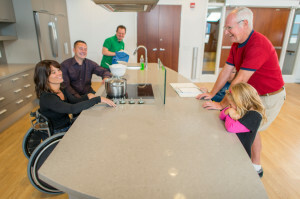 While many aspects of the home may need to be changed if the homeowner becomes disabled, the kitchen – the heart of the home – could need the most extensive upgrades. There are many things to take into consideration when making changes to a kitchen for a disabled homeowner, especially if they happen to be in a wheelchair. Grabbing something off the top shelf is more complicated than grabbing just grabbing a step stool. In some cases, an entire remodel may be in order. Some simple solutions can be made to the kitchen cabinets, such as changing drawer or cabinet hardware. Knobs may not be as easy to grasp as they once were, so consider using larger, hooped pulls that won’t need as much dexterity to open. Another quick fix would be to move commonly used items to lower cabinets or drawers. More extensive changes can make everyday living more comfortable. Most kitchen counters are 36-inches tall with base cabinets underneath. By lowering these cabinets up to six inches, and removing the base cabinets, a wheelchair homeowner will be able to move right to the work area. Shelves that pull out of the cabinet – think cutting boards – can also be placed to provide a more comfortable work area. By lowering these cabinets up to six inches, and removing the base cabinets, a wheelchair homeowner will be able to move right to the work area. The same can be done for the kitchen sink. By adding a shallow, lowered sink, with plumbing moved closer to the back wall, ample space can be made for legs. Moving the faucet to the side of the sink will make for more accessibility, and a one-touch faucet will make it much easier to turn on/off the water. There are solutions for upper cabinets as well. Lowering the cabinets, installing pull-down shelving, or adding Lazy-Susan cabinets are all options that can make kitchen items more accessible. There are even electric-powered adjustable cabinets that can be installed, although these are a more costly feature to add to the kitchen. Appliances can also be made more handicap-friendly. Some ranges are built with cooktop controls on the front so homeowners won’t need to reach across hot burners. Oven doors that open from the side instead of the top are also easier to operate. And while many appliances should be lowered, the dishwasher should be raised and accessible from either side. Other fixes – such as lowering outlets and lighting controls – can also be made during the kitchen remodel. Finally, the floorplan itself needs to be considered as well. Having a kitchen island was helpful two decades ago, but could now impede a homeowner in a wheelchair. Major appliances may need to be moved as well, and kitchen tables might have to be downsized. Entrances to the kitchen – as well as the rest of the home – should be widened as well. These are just a few of the changes that can be made to keep the kitchen accessible for all users. Contact Designers NW for more information on remodeling kitchens for the disabled.